Many users have been plagued with Internet problems with Windows 10. In some cases, Microsoft has even acknowledged these problems and released patches to fix them. However, many users continue to have problems with their Internet, regardless of whether they are running a high-performance ultrabook or a super budget $200 laptop. Thankfully, if you ever find yourself without Internet on your laptop powered by Windows 10, you aren’t without options. 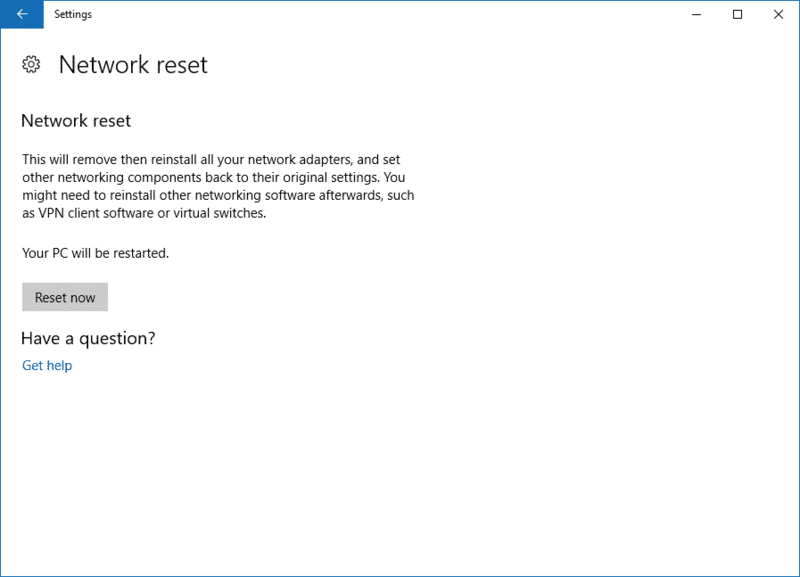 There are many different things you can try to reset your network settings in Windows 10 and restore your Internet back to working order. Today, we will look at a few of the best ways you can restore your Internet on Windows 10 so you can get back to work or play. Before you get started, you first need to make sure your Internet problem is actually your Windows laptop and not your Internet itself. Try your Internet on a different device. If you have connectivity, you know your network and Internet are functioning properly. If you don’t, you may need to reset your modem and router. In more extreme circumstances, you may need to contact your Internet provider to resolve the issue. Once you determine your Internet is fine but you are still having problems on Windows 10, then you will need to try one of the methods below to restore your Internet. I know what you’re thinking, we PC guys always say restart your machine. That’s because it works. However, in this case, I believe you shouldn’t just do a simple restart. Instead, power off your computer. We want to give the network card a complete reset, and the only way to make sure that happens is by completely powering off your machine. You may even consider unplugging it from power, as well. If you have a laptop, then consider pulling the battery, if you can. Once it’s off, wait about 20 seconds and then power it back on. Give it enough time to come up and then try your Internet again. If you have a laptop, I guarantee that you have a button to turn your Wi-Fi on and off or, at the very least, you have a keyboard combination that probably makes use of the “fn” key to turn the Wi-Fi on and off. There is a chance that your Wi-Fi card has been turned off. If you have a button, you may have an indicator light that tells you if it’s on or off. But, there may be no light at all. If you are unsure if you Wi-Fi is on or off, then try pressing the button or the key combination for your laptop and see if your Internet comes back on. If not, make sure you press the combo again to undo what you just did and then move on to the next method. This is one of my go to methods for troubleshooting and repairing Internet connections. Why? Because in my experience it works very well. 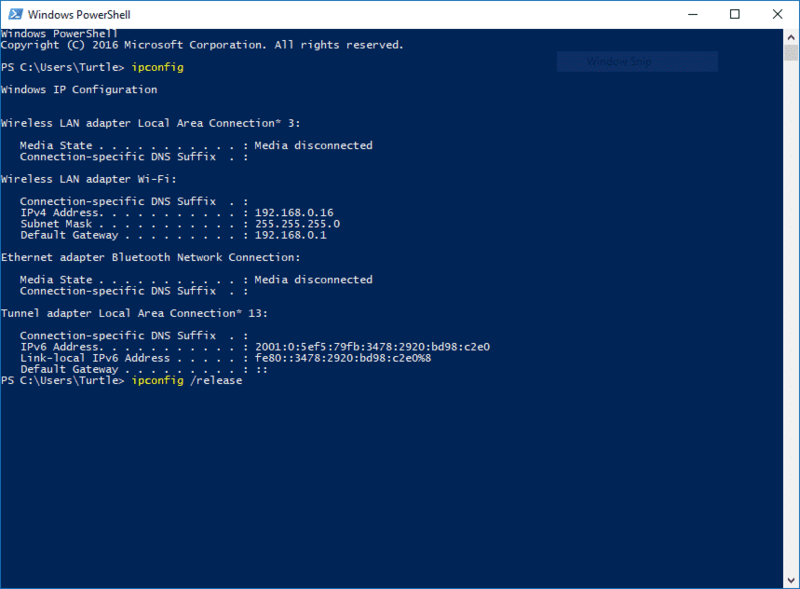 Basically, using the Command Prompt or Windows Power Shell, you are going to tell your computer to release the network settings on your network cards and then renew them with new information. These commands will reset your network connections and attempt to give you a new network address. Occasionally, you may have to reboot your computer after issuing these commands, but in most cases if it works you will have Internet again. I have to admit, I have never had that much luck with this one. But, if you aren’t quite sure what’s going on, then the troubleshooter may, at least, be able to point you in the right direction. Occasionally it may be able to fix the problem for you, so if you don’t have Internet it’s worth a shot, but I wouldn’t count on this one being the final solution to your problem. In my experience, all it can really do is point you toward the area where the problem is. However, if you are encountering the Windows 10 networking bug, then it may of no use to use, whatsoever. Once it loads, then just answer the questions to the best of your ability and it will attempt to correct your problem or find the source of the issue. Sometimes, you need to manually change your network adapter settings in order to restore your Internet service. You may need to change things such as your IP Address, DNS server, and more. This is also a good way to troubleshoot your problems. If you have DHCP, for example, you can try setting a manual address to see if that restores you network. To access your adapter options, go to Start > Settings > Network & Internet > Change adapter options. 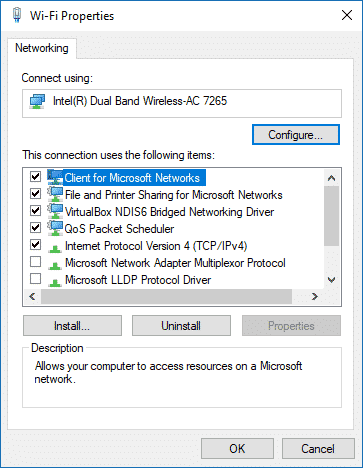 From there, select the active network connection you are using, most likely a Wi-Fi adapter or Ethernet adapter, by right clicking on it and clicking Properties. Once you are there, look for IPv4 in the list and click Properties. You can then make changes to all the settings. Reset them or adjust them to your network and then exit the properties and your connection will reset. As Microsoft releases new updates, it isn’t uncommon for the drivers that power the hardware on your computer to become out of date. In more extreme cases, the drivers become completely obsolete and don’t function at all. When this happens with your network card, you can bet you will have problems. If you continue to have Internet problems on Windows 10, try updating all your drivers. First, run Windows Update to get all the drivers from Microsoft. The company maintains a pretty extensive hardware database and there is a good chance they will have a compatible driver. If they don’t, you may have to figure out the type of network card you have and get the driver straight from the manufacturer. If you continue to have problems, make sure you have run all the driver updates available for all your hardware and try to update or even reinstall your network driver. When you are finished, reboot your computer and give your Internet a try. Resetting network settings has become common thanks to iOS and Android, as these mobile operating systems have included a command to do this for many years now. With the release of Windows 10, Microsoft has also made this command available. This reset will wipe out everything stored about your network settings, including all Wi-Fi networks, passwords and any other important settings for your networks. Because of this, I recommend using this only as a last resort. To access the Reset Network Settings screen, click on Start > Settings > Network & Internet > Network reset. A new window will open asking you to confirm the reset. Click on Reset now and your PC will restart with all your network settings wiped from your computer. These represent the most common methods I have found to restore your network settings in Windows 10. This is by no means a completely comprehensive list of what you can do. Chances are, some of you out there have found other ways that worked for you. If so, I encourage you to post them below to share them with the rest of the class. If nothing seems to work for you, then you may want to try resetting your PC or reformatting your drive. If, after all that, you are still having problems, you could be having hardware problems, and that’s a discussion for another day. There is nothing more frustrating than not having Internet on your laptop. Windows 10 has been plagued with this problem ever since it was released two years ago. Some versions of Windows 10 have resolved the problem while others still suffer from it today. 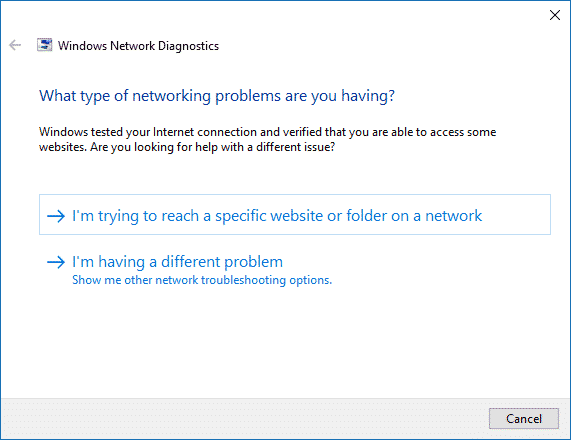 The methods I have highlighted above are some of the best ways available to fix your Internet issues in Windows 10. These aren’t the only way to do it, however, and there are many other ways you can troubleshoot your Internet. What ways have worked for you? If you didn’t use one of these or tried something different, what worked for you? Please share your experience in the comments below so we can give our users every possible fix for this annoying bug.